Yes, I know what you're thinking. If he is under-producing with limited minutes as a backup, why would Brad Stevens put Gordon Hayward back into the starting-5. My answer to that is the Celtics have invested a lot of money in Gordon, and it is time to test the wisdom of that investment. My first take from last night's 115-111 loss to Golden State is that this one was totally winnable throughout the game, and but for some miscues late, the guys in green could have taken this contest. The bench contribution from Jaylen Brown, Terry Rozier, and particularly Hayward, was not sufficient. Gordon scored only two points in 22 minutes and missed all five of his shots. Gordon's problems started early - with 3:51 left in the first quarter. He had an easy layup under the hoop and chose not to dunk the ball. He was fouled and missed the bunny, and also missed the chance for a 3-point play. He later drove into the lane with his pass-first mentality and lost the ball. He then missed a running layup. FYI: The Celtics are 12-3 when Gordon Hayward has a USG% of 20.0 or higher. Lets get down to basics here. The trade deadline is 11 days away, and Brad Stevens and Danny Ainge need to realize what they have right now and what needs to change. What we have now is a healthy, effective starting backcourt of Kyrie Irving and Marcus Smart. We also have a healthy, playoff-like Al Horford. Jayson Tatum needs more looks, and his Jay-Team partner, Jaylen Brown keeps improving. At least for the next several games, Gordon needs to start games and log more minutes. What I see is that his inability to finish at the rim by going airborne and being aggressive is more mental than physical. Can you blame him? I can't. I don't see Boston's investment in Hayward a failure. But if by some chance it is, this is the time to find out. Start him - give him more minutes - get him more involved in the offense. Move Marcus Morris back to the bench, and let's see what we have in Gordon. 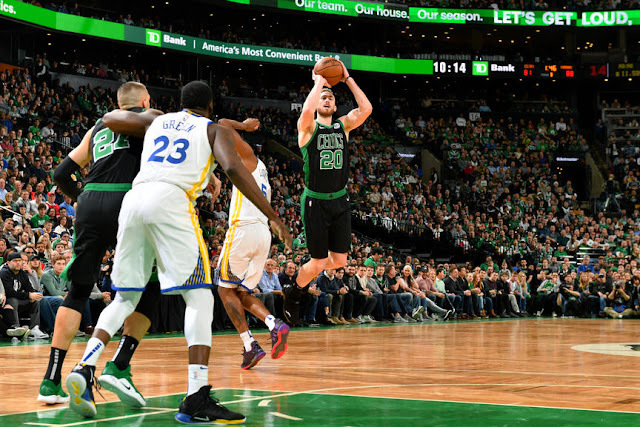 The Warrior's bench didn't particularly set the parquet on fire last night either, so a more-consistent starting unit for Boston may be the key to competing with Golden State. We need to see if Hayward can live up to what Brad and Danny saw in him. It's time. NOTE: As a reader of CelticsLife, have you ever thought of writing for this blog? We can always use one or two more writers that can put their thoughts and ideas into words on a regular and reliable basis. If you already are a regular responder in our comment section, you already have a following and will gain more. This is not a money-maker for anyone, but the rewards are there for the right person(s). Quality, regular and reliable writing is what we are looking for. Be honest with yourself. Can you do that and stick with it? If so, let me know in the comment section, and I will point you in the direction of our higher-ups.